It's that time of the week when I do an update. I can't believe it's already week 3 of the challenge, and I hope everyone who is taking part has had a good week. Pamela has been looking for ways to avoid late night snacking (also my weakness) and has a great tip, plus she shared a list of Words to Avoid on a Menu, very handy for when you're eating out. Pondering Plastic Surgery blogged about her obsession the bathroom scales, and coming to terms with her current size. If it's any consolation PPS we are the same height but I'm much heavier than you. Very Bored in Catalunya realised she could go to a BBQ, have a couple of glasses of wine and still lose weight! I think it's all about finding a balance. And Karamina blogged about wanting to set an example to her daughter, and getting away from the diet mentality. For some reason though I can't seem to find the correct link to that post - Karamina can you help? Caroline returned from holiday to begin the challenge, and spent much of the first week getting organised but still managed to lose a whopping 3.4lbs! • to increase my daily walking time with Tess; my average daily walking time for the week is only 30 minutes, however there is a very good reason for this. About 10 days ago I started having a very sharp pain in my ribs which got gradually worse over last weekend. My GP diagnosed it as costochondritis which is an inflammation of the cartilage between each rib (and it even hurt when I was breathing normally, never mind coughing or sneezing!) and she prescribed a very strong painkiller as the ones I'd been taking were not effective. Unfortunately I had a very strong reaction to the painkillers which meant I was feeling pretty ill for the next couple of days, in fact I only started to feel back to normal yesterday. So the walking has suffered, and there were a couple of days when the girls had to take Tessie out because I wasn't well enough. But I'm back on track now so hope to improve on my time for next week. • to work out a plan of healthy meal options and stick to it. I haven't managed to do a full week's plan, but I've been planning 2 or 3 days ahead and that's been working fine. It means I can have the right foods in and organise meals properly. • a 3lb weight loss; despite the illness this week - or maybe because of it? - I've lost a further 3¾lbs, making a cumulative total of 10lbs. to do at least one other form of exercise. This week something of a food revelation happened. On Sunday I was really hungry. I mean, really hungry, and I knew that an avocado salad - which was what I had planned - just wasn't going to touch the sides. So I made myself a bowl of pasta. Yes - pasta with a plain passata sauce, nice and simple, and I only made enough for one bowlful which in itself is something of a first. I really enjoyed the pasta, the hunger went and I didn't feel the need to eat anything else that evening. I think this is the first time I've ever really listened to my body and also haven't binged after 'lapsing', because previously pasta = naughty food. A valuable lesson about finding that balance between bingeing and making a healthy choice. to be able to shop for clothes anywhere, and not just in the big momma clothes shops! 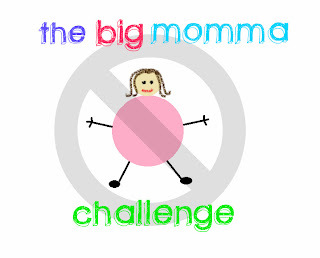 Well done to everyone who has taken part this week, and please feel free to join us on the Big Momma Challenge - the more the merrier! Please use the BMC badge on your blog posts and link back to here during the week. Good luck!